The end of the Group C and IMSA GTP era had left former rivals, Tom Walkinshaw Racing (who ran the Jaguar Group C and GTP efforts) and Porsche with very different but remarkably complementary problems. 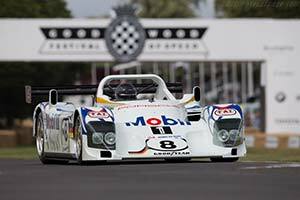 TWR was in the hunt for a new backer to continue operations in the company's American facility in Valparaiso, Indiana, while the strapped-for-cash Porsche could use a new sports racer as the basic 956/962 design dated back to 1981. As an added incentive, arch-rival Ferrari had returned to the arena with the 333 SP prototype racer. Through American Porsche specialist Andial's Alwin Springer, Porsche and TWR were introduced with the hopes of creating a car that could race against the new Ferrari in the American endurance racing classics; the Daytona 24 Hours and Sebring 12 Hours. In order to keep the costs to a minimum, TWR's Tony Dowe proposed to adapt the company's existing cutting-edge chassis, which had already been used for the Jaguar XJR-14 and Mazda MXR-01. The carbon-fibre monocoque was to be fitted with a spyder body to comply with the latest regulations and mated with the latest evolution of the Porsche 962 engine. Porsche's board agreed to the project and the work started in September 1994. TWR supplied a chassis but few, perhaps not even Porsche themselves, at the time or for years after knew that this was not just a XJR-14 type chassis but one that had actually had seen action as an XJR-14. Either way, it was a state-of-the-art carbon-fibre monocoque, designed back in 1990 by Ross Brawn. It featured double wishbone front suspension with push-rod actuated torsion bar springs and dampers. In addition to the existing tub, the construction of a second was started for what was intended to be a two-car effort. In addition to removing the roof, which opened the rather claustrophobic cockpit, much of the XJR-14's sophisticated aerodynamics was removed to comply with the new WSC regulations. Gone was the front wing mounted between the fenders as was the huge twin-element rear wing, and most importantly, the underbody ground-effect tunnels were replaced by a flat bottom. Mounted where the Ford Cosworth HB V8 was once fitted was the twin-turbo flat six used so effectively in the Porsche 962C. Breathing through a pair of mandatory 34.5mm restrictors, the all-aluminium produced around 540 bhp.